This was co-commissioned with Plerng Kob. Kakei is a traditional piece of Yike repertoire. However the troupe wanted to present it with a new angle, to question society’s expectations of women. The production premiered Bon Phum (Village Festival) in April, and has since been performed at locations around Phnom Penh in June – August. Female artists from Sounds of Angkor created a 20-minute piece demonstrating leadership roles from women in the arts. This was performed at Pannasastra University of Cambodia, Siem Reap, in January. 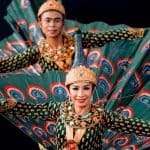 Yu Vek Selapak performs regularly in our Traditional Dance Show at the National Museum. In January we commissioned them to develop three new pieces: Melody of Drums, Tbal Kdoeurng, and The War of Pinunjit & Hanuman. In March 2017, we commissioned a therapeutic project aiming to use dance as a way to heal trauma. The audience watched a solo performance by CHEY Chankethya on the theme of body memory, before taking part in an interactive and creative workshop.